Potential CHTM! charity walking tour, January. | Come Here To Me! Potential CHTM! charity walking tour, January. Update: Going, going…..gone! Both tours are now at capacity. Thank you all so, so much. We’ll send on the details soon to all done to attend. Apologies if you missed out. 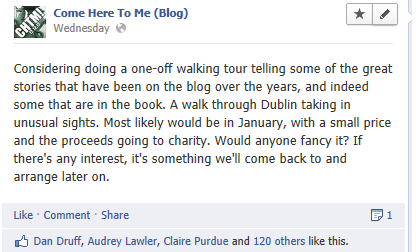 Earlier in the week, I asked on Facebook if readers would be interested in the idea of taking a charity one-off walking tour with us. I work with a tour company professionally (Historical Insights, we’re the lovely people you see outside the front gate of Trinity) and the idea of a one-off tour focused around the blog and book appealed to me, with the other lads chipping in a tale or two along the route. In the spirit of Come Here To Me the tour would be done for charity, and while obviously I’d like to contact them before putting any names here, it’s the elderly of Dublin we’ve had in mind. The response was phenomenal. We’re now tempted to do two, one on January 3rd 2013 and one on January 4th 2013 with a 1pm starting time provisionally. The tour would last just over 2 hours, with a €10 asking price and that money going towards a good cause. From experience, I’d like to keep the groups to 25 people maximum. The tour would leave from a city centre location (obviously enough! ), perhaps The Spire. If you’re interested, drop an email to comeheretome.dublin@gmail.com, saying which day’d suit you. I think it’s the most democratic way to do it, as we’ve asked both on Twitter and Facebook and the response is huge. If you miss out, there’s nothing saying we won’t do another charity tour in the future, don’t hate us! Great idea! And I’m elderly so I can go on the tour and get paid at the end! You’ve surpassed yourself DF! Fair play lads. Would love to be in Dublin for it. Want me to throw you down for either Bernie? Need people to put themselves down in advance, apols if you’ve already emailed!